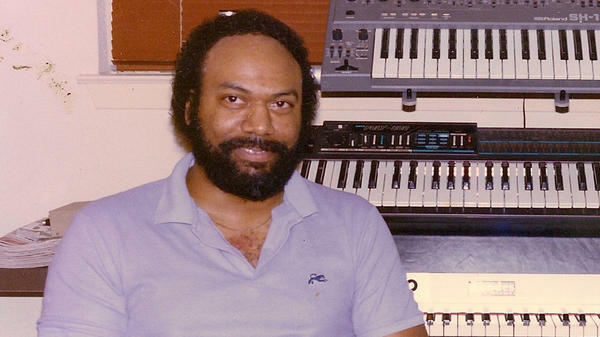 Electronic soul artist Jeff Phelps with his synthesizers. Early synthesizers were supposed to imitate or re-create other existing sounds, but as anyone can tell you, they mostly sounded like synthesizers. That distinctive whine and wheeze captivated all manner of pop artists, from prog-rockers to classical composers to soul musicians. However, back then, synthesizers were so expensive and bulky, you needed a major-label budget and an entire studio wall to install them. The home revolution in electronic music gear didn't happen until the mid-1970s, when miniaturized components helped bring down the price and size. Synthesizers and drum machines began popping up in many a wood-paneled basement, and a generation of novice musicians began to tinker. One particularly fascinating aspect of this period: the sound of electronic R&B, which has been captured on a new compilation titled Personal Space: Electronic Soul 1974-1984. The new anthology revisits an era when R&B producers and singers could tape songs at home, take them to a local record plant and press up a few hundred singles. That cohort included Starship Commander Woo Woo, the science-fiction-inspired nom de disc of Kansas City DJ Omer Coleman II, as well as the astrologically inspired duo from Grosse Pointe, Mich., called USAries. Electronic soul wasn't just for amateurs: The home-studio era also empowered veteran artists to experiment outside the confines of label- and radio-approved guidelines. Cincinnati blues legend Albert Washington can be heard trying out an early drum machine in "Shortest Lady," a single he produced for his wife, Deborah, and her band, The Astros. By today's standards, the technology behind these songs may be archaic, but that doesn't mean the music is anachronistic. Pop's hunger for its own past seems to continually lead contemporary artists back to lo-fi aesthetics. Vintage gear once consigned to junk heaps is now rehabbed and sold to a new generation of bedroom musicians. It's a testament to the appeal of the once-lowly synthesizer that the most inorganic of instruments has now come to sound perfectly natural. Let's take a trip back in time to the 1970s and the explosion of electronics in popular music. Artists began making recordings at home with rudimentary synthesizers and drum machines. A new disc called "Personal Space" captures the effect of this do-it-yourself boom on R and B. Here's Oliver Wang with our review. OLIVER WANG: Synthesizers were supposed to imitate or recreate other existing sounds. But as anyone can tell you, they mostly sound like synthesizers. WANG: That distinctive whine and wheeze captivated all manner of pop artists - from prog rockers to classical composers to soul musicians. However, back then, synthesizers were so expensive and bulky, you needed a major label budget and entire studio wall to install them. The home revolution in electronic music gear didn't happen until the mid-1970s, when miniaturized components helped bring the price and size down. Synthesizers and drum machines began popping up in many a wood-paneled basement and a generation of novice musicians began to tinker. WANG: The new anthology, "Personal Space," revisits an era when R and B producers and singers could tape songs at home, take them to a local record plant and press up a few hundred singles. That cohort included Starship Commander Woo Woo, the sci-fied nom de disc of Kansas City DJ, Omer Coleman the II. WANG: As well as the astrologically-inspired duo from Grosse Point, Michigan, USAries. WANG: Electronic soul wasn't just for amateurs. The home studio era also empowered veteran artists to experiment outside the confines of label and radio-approved guidelines. Cincinnati blues legend Albert Washington can be heard trying out an early drum machine on a single he produced for his wife Deborah and her band, the Astros. WANG: By today's standards, the technology behind these songs may be archaic, but that doesn't mean the music is anachronistic. Pop's hunger for its own past seems to continually lead contemporary artists back to lo-fi aesthetics. Vintage gear once consigned to junk heaps is now rehabbed and sold to a new generation of bedroom musicians. It's a testament to the appeal of the once-lowly synthesizer that the most un-organic of instruments has now come to sound perfectly natural. SIEGEL: Oliver Wang is an assistant professor of sociology at California State University Long Beach and writes the audioblog, SoulSides.com. He reviewed the new compilation, "Personal Space." Transcript provided by NPR, Copyright NPR.